Home » Chinese Health Secrets » This Week’s Emperor’s Power Walk-week begin February 01, 2019: Feng Shui Info & Auspicious Day. This Week’s Emperor’s Power Walk-week begin February 01, 2019: Feng Shui Info & Auspicious Day. OUR WECHAT RADIO SHOW IS LIVE EVERY TUESDAY. TO LEARN MORE ABOUT FENG SHUI PLEASE CONTACT ME ON WECHAT:ZHIHAIFENGSHUIMASTER. Use Regular Time. Be sure to use the right walks. Check our blog here for Zodiac 12 animal predictions in the year of the Monkey. The Emperor’s Power Walk is very simple to do and it will change your life. Just follow these three easy steps. 1) Get your FREE custom map. One map is good forever ( “GET MAP” ). 2) Look up the best direction to take a short effortless 15 minute walk when you first leave your house in the morning (see chart). Read more in the complete post below if you have any question. REMEMBER to check if you are in Daylight Saving Time or Regular Time. Need More Info? Read on for complete instructions. You do the walk when you first leave your house in the morning. This is important because studies have proven that at night your “Chi” energy diminishes. Imagine your house is the middle of a clock and the hands point to eight different “sectors” which are like the points on a compass. By walking in the correct sector first thing in the morning you automatically replenish that Chi for the rest of the day. How do you know which sector and where it is. Simple. look at the FREE map we give you. You only need to do it once a day. It is simple and does not have to be strenuous. For example, take a look at the chart at the top of this post. It has several time zones based on when you first walk outside. I In this example if you get up and leave your house between 6-8 AM (regular world time) then your very best walk is in the BLUE/GREEN sections of the chart….that first day’s first time period on the chart is <<NW>>…. just walk in that sector when you leave the house (you can get your custom map by clicking “GET MAP” ). Just walk or drive in the best sectors for the first 15 minutes of the day. Every day use the direction indicated on the chart. In the above example, between 6-8 AM the red sector (or Dead Door) is <<SE>> which indicates a bad luck direction for that day/time period. If you ever had one of those “bad days” you may have walked in the bad sector when you left your house first thing in the morning. Just follow the chart in the good sectors and don’t walk in the RED bad sectors for the first fifteen minutes of the day. Realized increased health and so much more. I know it sounds hard to believe. A simple walk can do all that but this is a 5,000 year old secret of universal energy and has proven totally effective with my students, clients and readers. No matter what time you get up just look up the appropriate time sector on the chart and take the walk. If you are new to the Emperor’s Walk you will probably experience a complete change in your sense of power. The Emperor’s Walk is often referred to as “Outdoor Feng Shui” and was used by EVERY Emperor of China for the last 5,000 years to assure maximized power, health and wealth. Unlike Architectural Feng Shui which has to do with structures, outdoor Feng Shui is directly related to forces of nature and the universe. If you are interested this site contains a wealth of knowledge about the walk and its origins. All Feng Shui practices have the potential to really improve your life. Some other forms I practice are residential Feng Shui , commercial Feng Shui and office Feng Shui . Other Important Daily Information: Is this your Auspicious Day and Why is this so important? Auspicious Days are based on your birth date and the relationship of that birth date to the universal energy today. Therefore if you know your Chinese astrological birthday sign (animal sign) you can do important things on good auspicious days and leave small things or relaxing to other days. Zodiac rat: avoid horse day and horse hour 11am—1pm (DLS 12pm—2pm)Each animal sign has certain days and hours that are NOT auspicious (good) for you. Avoid those days and times by relaxing and staying away from important tasks or responsibilities. For example, if you are Rat sign and today’s auspicious day is “horse day” (see Today Auspicious day is above) than you should relax today and stay away from important tasks. Here’s how it works. If you do not know your animal sign you can look it below. Remember. I am always available to discuss any of these topics with you. Please write me at zhihaifs@hotmail.com . Generally speaking you can use the below information to get an overview of basic Auspicious day information based on your sign but always pay more attention to Today’s Auspicious Day Info. This information is also good for your daily life organization and planning. In addition to the specialized daily information mentioned above, the below auspicious day information is more generalized for all days and is based on the “Qi Men Dun Jia” black and yellow 12 time zones (奇門遁甲日盤「黃道、黑道十二吉凶時辰」.Every Day has unique levels of energy that affect daily outcomes. Good days, bad days. We have all had them. Or short time periods where things seem to just “click”. Everything’s going great. Almost ALL Chinese people attempt to do important things (like getting married, starting a new job, moving into a new house) on “good” auspicious days and at “good” auspicious times of the day. Here’s how it works. If you do not know your animal sign you can look it up below. Each animal sign has certain days and hours that are NOT auspicious (good) for you. Avoid those days and times by relaxing and staying away from important tasks or responsibilities. For example, if you are Rat sign and today’s auspicious day is “horse day” (see Today Auspicious day is above) then you should relax today and stay away from important tasks. Note: This is the most accurate zodiac chart available. Most only provide a day (not hour). To find your exact animal sign you must check the time and day since there is overlap. Zodiac Sign Based on Solar Term: (note some minor overlap in minutes). Find Your Chinese Animal Sign- Look up the year/time you were born (Based on 24 hour clock). See a full week of Emperor's Walks instead of each day. This page is printable. or..... subscribe and get it delivered daily via email. 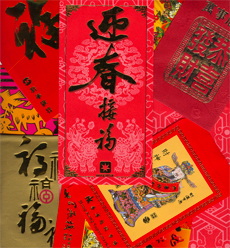 In the Chinese culture students often give "Red Envelopes" to the teacher to show respect for their learning experience. It does not matter what amount is given although there are theories about certain numbers. Generally it is a sign of appreciation. If you would like to support this work, Please donate what you'd like. Even a small amount is a giving gesture that signifies your respect for the walks.